It’s a sunny, warm Thursday in Erie today. Looking out the window, one would guess that the Fourth of July, not Halloween, is approaching. However, as I walk though the school I’m reminded that this is October. Our school is decorated in spooktacular fun with goblins, pumpkins and spiders while Happy Halloween banners drape the halls. As the school prepares for the annual Halloween Parade, I’m reminded of how important preparation is for this holiday. I’m also reminded of one of Ryan’s favorite Halloween costumes…Big Bird! It’s important to plan for Halloween as this is a change in routine and as we all know, change has the potential to become a challenging situation. Below are some tips that I learned after both positive and challenging trick-or-treating evenings with my son. Read a few books about Halloween activities, trick-or-treating, carving pumpkins and wearing costumes. This will prepare your child for the evening. – It’s always best to choose one that reflects his/ her interests. When Ryan was a preschooler, he was Thomas the Train and Superman, but as he got older, he chose to be a ghost for a number of years. – Practice wearing the costume. If a costume doesn’t work, ask if he/she would rather wear face paint, a hat or a mask. – No costume is okay too. – After experiencing a challenging Halloween, I decided to limit our trick-or-treating to two homes. Ryan and I only visited my sister Mary Beth and friend Jeanne. This kept it short and sweet and avoided the candy battle. – Know your limits. As soon as you see your child becoming over-stimulated or agitated, it’s time to go home. It’s okay the end the evening. Role play for the evening: This provides a structure and outlines specific behavior for trick-or-treating. – A special diet requires special treats. What worked best for Ryan was fruit and money. I alerted my sister and friend to this so that they could be prepared. If you do go door-to-door, have some appropriate treats for your child at home to quickly exchange for what he/she collected. Keep in mind that there are alternatives to trick-or-treating. 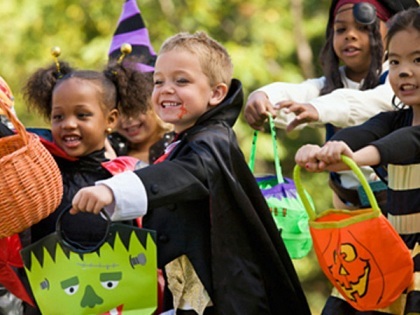 If you know your child’s not ready, it’s just as fun to stay home and pass out treats, read a story or watch a movie. Halloween comes once a year, so have fun, be creative, take pictures, laugh and enjoy! This entry was posted in Uncategorized and tagged asd, autism, barber national institute, children, erie, fun, halloween, moms, parenting, safety, tips, trick-or-treating. Bookmark the permalink.